Gardening in a straw bale. That's right, a straw bale. It is an immediate, relatively inexpensive, 100% compostable, raised bed. I feel like I'm telling you about a magic gardening pill that will help you grow garden fresh produce in as little as 10 minutes a week. (Call now!) According to others...it's true. Choose a full sun location for your bales, cover the area with several layers of newspaper or cardboard to keep weeds or grass in check in the area. You will place the bales on their side so the bailing twine is on the side, facing out. Orient the bales in a way that the plants will get the maximum amount of sun. Plants that will be large when they are mature should be planted on the north side to prevent them from shading out the smaller plants. Once the bales are wet they will be very difficult to readjust because of their weight. Day 4-6 Sprinkle 1/2 c. Urea (46 - 0 - 0) on the top of each bale and water the fertilizer in, careful not to wash the fertilizer away. 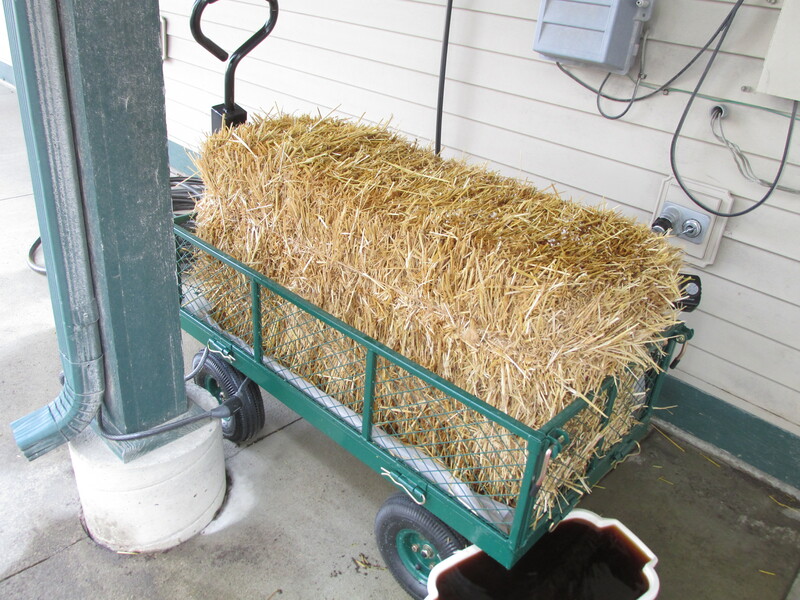 The fertilizer should start to work its way into the bale from the stream of water. It may not completely disappear but it should not remain entirely on the top of the bale. The fertilizer and water start the decomposition process inside the bale. As with a compost pile, the bale will begin to heat up once the decomposition has started. Check the bale after Day 11 and as long as it is cool to the touch you are ready to start planting. You can either use transplants or seeds in the bale. If you are planting transplants, put planting holes into the bale with a trowel or garden knife, add a small amount of compost or potting soil to fill in around the root ball. 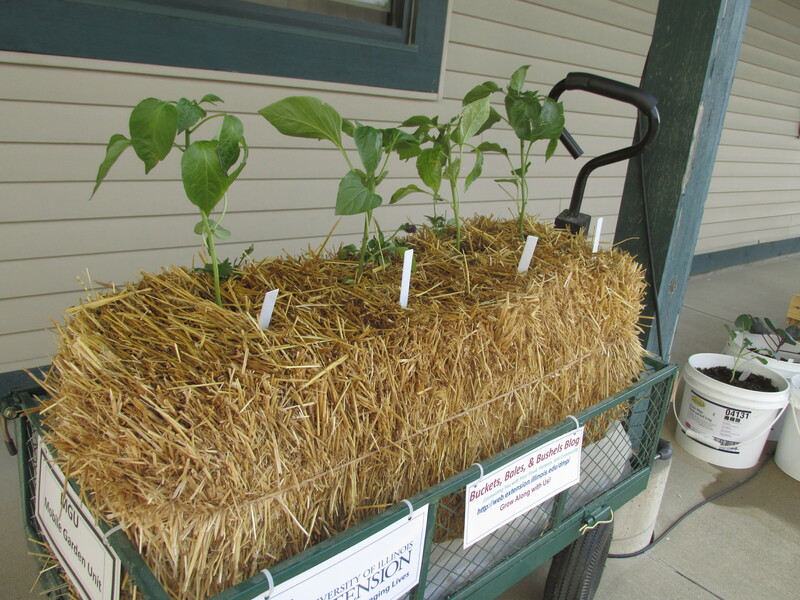 If you are using seeds, spread a layer of potting soil or compost over the top of the bale and plant as you would a typical garden. You can water the bales by hand or use a soaker hose, with or without a timer. Depending on how much time you have to spend in the garden, the soaker hose on a timer might be the best option. Although more time consuming, watering by hand allows you the opportunity to scout for pests, diseases or nutrient deficiencies. There will be a greater need for fertilization since there is not any soil in the system and the bales don't have nutrients like garden soil would. You can use compost tea or liquid fish emulsion once every other week while the plants are seedlings. Increase fertilization to once per week when the plants get larger. 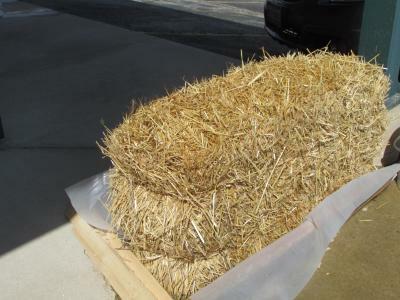 Straw bales are a great option if you have poor soil, have had disease or nematode problems in the past or aren't able to rotate crops as usually recommended due to limited gardening space. Each bale is used for only one season. At the end of the season, the bales can be broken up and used as mulch or added to your compost pile. There are two bales on display at the Piatt County Extension Office (210 S. Market Street, Monticello). One is placed directly on the walk with a thin layer of plastic beneath it to help retain some water and the other is in a garden cart. Why a garden cart? What a great opportunity to create a mobile garden unit (a.k.a MGU). Be on the lookout for it around Monticello!